The cold Rhode Island winters can create many different issues for homeowners, with pipe bursts being the most problematic. When water freezes it expands, and when that water is inside a pipe, then it creates a burst, which will in turn cause water to spray out of the pipe once the water flow returns to normal. It doesn’t matter how sturdy the pipe is, it could be plastic or metal, the pressure that the frozen water puts on the pipe will be powerful enough to break it. 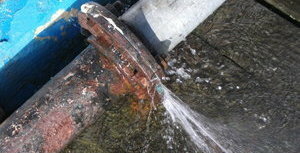 The pipes that are most susceptible to bursting are those that are completely exposed to the elements by being outside. However, even if they are in areas such as basements, garages, attics and crawlspaces, they can easily break since they are in unheated spaces. Also, pipes that are inside walls that have little to no insulation are at risk. There are simple steps that homeowners can take to prevent bursts from occurring, which will then stop water from flooding the home once the water thaws. Before the cold weather comes you should drain your swimming pool, sprinkler system and other outdoor water supply systems. Make sure you do this by following the manufacturer’s instructions, as opposed to using harmful chemicals like antifreeze, since it is harmful to the environment and animals. 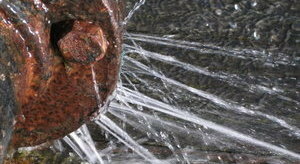 Drain all water from outdoor hoses and close the valves to their water supply. After you have closed the valves, open the outside faucet to let all the remaining water out. Keep the valve open to let out any water pressure if lingering moisture is present. Keep your basement, attic and crawlspace insulation in tact by replacing damaged patches and adding more if necessary. This will keep these areas warm during the winter, which will in turn warm up the pipes that run through these spaces. Inspect your garage, under the kitchen sinks and inside bathroom cabinets to make sure the pipes in these spaces are not leaking in any way. You should also add insulation to these areas to keep them warm. You should insulate the individual pipes in areas that are the most susceptible to freezing. There are insulated sleeves you can buy that cover the pipes, as well as heated tape that will keep them warm during even the coldest months. By taking the time to maintain your pipes and plumbing system in the warmer seasons you will save yourself headaches and money throughout the rest of the year. If your pipes do end up freezing, and you catch it in time, then you can thaw them out before they burst and let water flood the area. One of the first signs of a frozen pipe is if you turn on a faucet and little to no water comes out. Heating up the pipes with a hair dryer, space heater or heating pad are easy and effective ways to melt the frozen patches. You can even soak towels in boiling water and wrap them around the pipes. You should keep your faucets open throughout the thawing process, this way as the ice begins to melt the water will begin to flow through. Keep the heat on the pipe until the water begins to flow at its regular speed. The running water will also help melt the ice quicker. In fact, letting a small amount of water trickle from the faucets at all times is a great way to prevent freezing from occurring in the first place. You can also prevent freezing pipes by keeping your garage closed to keep the cold out and keeping sink cabinets open to allow heat in. Keeping your home’s heating system on and at the same temperature around the clock will also keep pipes from freezing and bursting. 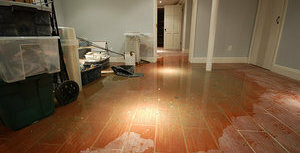 Pipe bursts do not have to be something inevitable in the winter. Just stay up to date on your home maintenance and you can enjoy a cozy, dry holiday season.